A 24-year-old woman who works at a Washington, D.C. firm that did business with Nevada Rep. Ruben Kihuen’s campaign said the freshman congressman made unwanted overtures and asked overly personal questions of her this fall while his campaign was a client of her firm. The woman, who asked not to be identified because she fears it could jeopardize her future career prospects, is the fourth to come forward with accounts of unwanted advances from the 37-year-old Democratic lawmaker and the first to publicly describe interactions that happened after he was elected to Congress. The House Ethics Committee announced Friday that it would open an investigation into allegations of sexual harassment against Kihuen; the congressman said he welcomed a chance to clear his name, although he announced on Saturday that he would not seek re-election because he claimed allegations would distract from running a campaign. The woman described to The Nevada Independent conduct that she said made her feel flustered and uncomfortable, including Kihuen asking at the office why she didn’t have a boyfriend, asking if she lived alone and offering to help her move up in her career — something she interpreted as a possible suggestion for sexual favors. At one fundraiser, she said, he rubbed her lower back and kissed her face several times. She said the culture on Capitol Hill was to joke about Kihuen, who is unmarried, as flirtatious and confident. Fifteen minutes after responding to the Independent, the Las Vegas Review-Journal published a story in which Kihuen announced he will not seek re-election. “Congressman Kihuen’s decision not to run for re-election speaks for itself. We deserve better from our members of Congress,” the woman said Saturday afternoon, after learning of the decision. Kihuen and the woman knew each other from general interactions when Kihuen came to her firm — she said he had asked her in the past if she was an intern — as well as a brief conversation in an elevator and instances when Kihuen tried to start conversations with her through his personal email and cellphone (she showed a reporter images of the email and texts he sent; she said she tried to communicate a lack of interest or not respond). But things took a more personal turn when she and the congressman, 13 years her elder, both attended a karaoke-themed fundraiser at a bar on Oct. 25. A text message exchange provided by a 24-year-old woman whose firm has worked with Rep. Ruben Kihuen shows she told friends about Kihuen’s interactions with her the night she says they happened. The woman said Kihuen asked how she stayed so fit, and when she said she runs, he asked if she wanted a running buddy or a bodyguard. The friend said she thinks Kihuen could write the situation off as flirting, but she believes it was inappropriate because of the way he’s leveraged his role in Congress. The woman said she tried to discreetly seek opportunities to get away from Kihuen during the event, and tried to offer responses that indicated she was not interested, but he kept returning to talk to her. She said some of her friends have asked why she didn’t reject him, outright. Other women who have made accusations against Kihuen said his behavior persisted in spite of their protests. A Kihuen campaign finance director identified as Samantha described how she reacted when Kihuen allegedly suggested the two get a hotel room together. Samantha, who has asked to keep her last name anonymous, told The Nevada Independent Saturday via text message that it’s “insulting” Kihuen continues to deny the harassment allegations. “The tone of his apology after the Buzzfeed article on December 1 was basically ‘I’m sorry if I did anything to make her uncomfortable’ as though I’m the problem for being upset by his behavior,” she wrote. 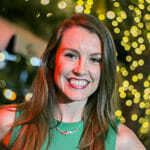 A lobbyist who told the Independent about instances of unwanted touching from Kihuen and said that she received hundreds of suggestive texts from him in the 2013 and 2015 Nevada legislative session said she tried a number of different tactics after receiving the messages, including brushing off the remarks as a joke, ignoring him and directly telling him “no.” A third woman, who worked as the front desk attendant at Kihuen’s Las Vegas condo in 2014 and 2015, told Buzzfeed that he would text her “creepy and nasty” comments at odd hours, forcing her to eventually block his number after he ignored her requests to stop. The woman who works in Washington D.C. said she debated whether to come forward with her story after the first Buzzfeed article earlier this month. But she said she wanted to offer more nuance to the discussion and insight into interactions that aren’t as extreme as, for example, when Arizona Rep. Trent Franks asked a female employee to be a surrogate. The woman said the interactions with Kihuen started in October when they took an elevator together. She said she tried to brush it off with a joke. Also during the elevator ride, she said, Kihuen asked how old she was and when she said 24, “he said I still have time.” A screenshot of a text message exchange she provided to The Nevada Independent shows she referenced the question about her age while talking with a friend about Kihuen. 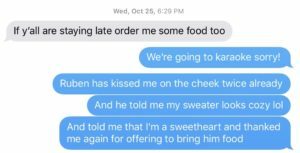 A text message exchange between a 24-year-old woman and a friend on Oct. 17, 2017 shows her deliberations about how to respond to Rep. Ruben Kihuen’s actions toward her. The exchange took place after the elevator interaction, texts and email from Kihuen, and before the karaoke night. The woman said some people viewed the advances as amusing and a joke, and she said she received encouragement to pursue a fling with Kihuen when he started showing interest in her because it could advance her career. But she said she was troubled by the situation, seeing it as potentially damaging to her reputation and something that “delegitimizes” her as a professional. “I want to be taken seriously, and it’s just an insult to all the work that I’ve done and to my intelligence to look me up and down and ask me how tall I am and if I play any sports because I look really athletic,” she said. A second encounter came about two weeks later, she said, when she ran into Kihuen in a hallway. When he struck up a brief conversation, she told him she was headed to a lunch event but said there would probably be leftovers if he wanted some. Leftovers were commonly made available to people in the office after events. 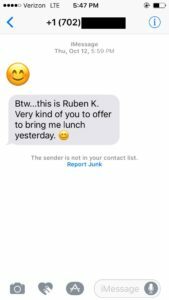 A text message from Rep. Ruben Kihuen to a 24-year-old woman whose firm worked with him. The Nevada Independent verified that the text came from Kihuen’s cell phone number. She said she ignored it, but said Kihuen brought up the leftovers at least one other time — something she said bothered her because it seemed to suggest there was deeper meaning to a statement she felt was mundane. She said one of the Nevada lobbyist’s statements in a Nevada Independent article earlier this week — that perhaps Kihuen doesn’t know that some of his behavior is wrong — resonated with her. Note: Editor Jon Ralston explains our decision to publish here.